CCHATEAU ROCHECOLOMBE is a family business. Since four generations they work with the same passion for both the vineyard and for the wine. The know-how has been passed on from generation to generation. Born in "van Oudenaarde" (Belgium), Robert HERBERIGS is a well-known songwriter and artist. This Belgian painter, bought Château Rochecolombe in 1925 as a second home. At the time, the property was a large orchard of apricot trees and a few plots of vines. Shortly after the Second World War, his eldest son Gilbert and his wife Genevieve Van de Vyvere took over the reins of the estate, and they then turned the apricot fields into vineyards. 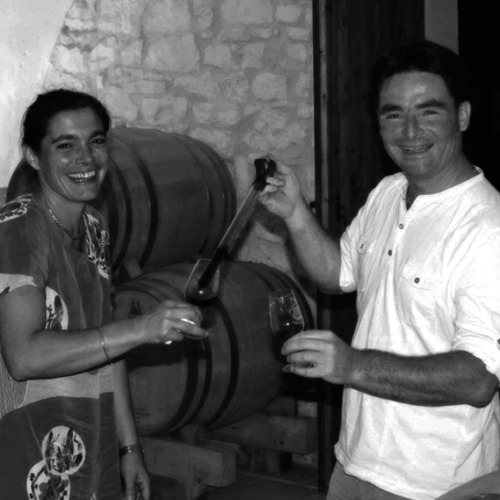 In the first fifteen years, the harvest was taken to the Cooperative Cellar of Bourg Saint Andéol, a winery that traded in Châteauneuf du Pape. In the 1960s he made the daring bet to create his own cellar for making Côtes du Rhône, while in the canton the main production was table wine. For 40 years he was President of the Union of Winegrowers of the Côtes du Rhône in the canton of Bourg Saint Andéol and for several years a board member of the Syndicat Général des Côtes du Rhône in Avignon. He is also behind the extension of the Appellation era of the Côtes du Rhône and the Côtes du Rhône Villages and the village additions such as Bourg Saint Andéol. He was also a strong advocate for traditional working methods.